ANNOUNCEMENT: The Fourth Annual Buster Keaton Blogathon! Posted on December 13, 2017 by Lea S.
Time sure sped by in the past year, didn’t it? 2017 being Buster’s centennial of appearing in films, we of course were celebrating him all year long (I sure did!). Now that the centennial is over, it’s time to get back…to our usual 24/7 celebration of all things Buster! When: Monday, February 12 and Tuesday, February 13, 2018. Where: Right here on Silent-ology! How: To sign up, pick a Keaton film or Keaton-related topic and leave me a comment on this post. (You can also send me a message). Further down this page are some banners to stick onto your blog–please help get the word out about this event! During the blogathon itself, when you publish your post leave me a comment or send me a message with your link. (Please make sure your post mentions both my blog and the name of the event, such as “This post is part of Fourth Annual Buster Keaton Blogathon hosted by Silent-ology.”) Post whenever you have time during those two days, no pressure! What to write about: Anything and everything related to Buster’s eventful life and lengthy career–don’t be afraid to be creative! (Here’s his filmography for some ideas.) I also encourage articles about his crew and the many wonderful actors who appeared in his films. For ideas and inspiration, here’s the links to the First, Second and Third Annual Buster Blogathons. To encourage a good variety of topics, I’m going to have one of those “no duplicates” rules (yes, yes, I know). I will be holding a drawing for all blogathon participants–stay tuned for details! As always, I want to encourage everyone to make Buster proud. There’s quite a bit of dubious information out there about his life (particularly his private life), so let’s try and steer clear of those persistent rumors and give him something to smile about! Welcome To My Magick Theatre | Steamboat Bill, Jr. This entry was posted in Blogathons and tagged blogathon, blogathons, Buster Keaton, Buster Keaton blogathon by Lea S.. Bookmark the permalink. From that wonderful Internet real estate known as Silent-ology. I call dibs on The Railrodder! In addition to THE RAILRODDER, could I also do a piece about Buster’s Educational and Columbia short subjects? Sounds good to me, Steve! Exciting news! Thinking cap is on. Looking forward to hearing what you come up with! Hi Lea. I’m in! I love Buster so much. I’d like to write about why I am a fan of Buster and his work. I’d like to write about the interviews Grace Kingsley did with Keaton in the 1920’s. I’m not sure what I’ll call it yet, though. Can I join with a commentary on CONVICT 13 (1920)? Thanks! Love this yearly Bustering. Hi Lea. 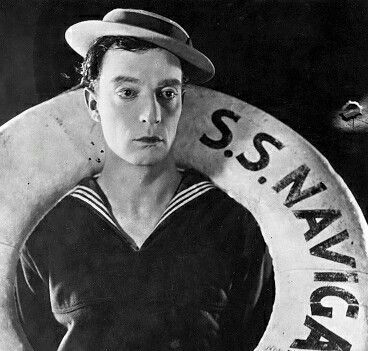 I’m so happy to see there will be a fourth Buster Keaton Blogathon. I have already started writing my entry about Buster’s experiences in the Great War and how they were reflected in some of his movies. I have a piece, based on a previous blog of mine in the works, about standing at Buster’s grave. I will be sending it to you on one of the two days. Thank you. Thank you for joining in, Rob! Yay!! Could I write about Our Hospitality? Absolutely! Welcome back to the Busterthon. I’m not sure which topic I’ll do yet, but please count me in for this! This looks like a really cool blogathon, I was wondering if it has not been taken already if I could do The General (1927)? Thanks! I really like your banners! Yes you can! Welcome to the blogathon, MovieCritic. I’d love to write about Steamboat Bill, Jr.! It’s my favorite of Buster’s features, and 2018 will mark its 90th birthday. I would love to participate! It’s been far too long long since I had the chance to write for a blogathon. I would like to write up something on Buster’s film work with Roscoe “Fatty” Arbuckle and Al “Fuzzy” St. John if that’s ok. Wonderful, I LOVE Buster’s work with Al and Roscoe! Thanks for joining. I would like to write about the history of Buster’s Beverly Hills estate for Old Hollywood Films. Great topic, I’ll add you to the list! Thanks, Amanda. I’m really sorry I had to bow out of this last year. I would love to be part this year though. Please put me down for “The Cameraman” ( 1928 ). Thanks. Yay! I was looking forward to this event since, well, last year! I wanto to write about The Villain Still Pursued Her (1940). Great topic, Le–welcome back to the blogathon! No, actually I did it only because Silver Screenings beat me to it! Hi. Sorry to be so late, but I would like to do a post on the box office performance of Buster’s silent features at my blog Senseless Cinema (www.senselesscinema.com). Thanks. Hello, I’d love to write about The Navigator for LA Explorer. Thanks! Sounds great–welcome to the blogathon, Melanie!